Nokia's first flagship Windows Phone 7 device, the Lumia 800, isn't just another handset from another hardware maker. 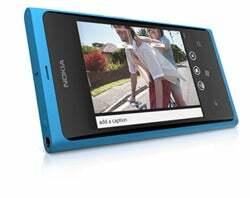 It's the future of Nokia, as the company puts the bulk of its high-end smartphone efforts into Microsoft's mobile OS. Hand it to Nokia for designing a smartphone that doesn't look like all the others (well, except for the MeeGo-based Nokia N9, which is nearly identical). The unibody polycarbonate frame and gently curved glass make for a striking combination, especially in the cyan color option that pairs nicely with Windows Phone's Live tiles. To make room for Windows Phone's navigation buttons, Nokia shaved the 3.9-inch display of the N9 down to 3.7 inches for the Lumia 800. Either size seems a bit small for a flagship phone, and although iPhone users may disagree, I would've liked to see the Lumia 800 go bigger. As far as megapixels go, the Lumia 800's 8-megapixel sensor is comparable to most other high-end smartphones. but the use of Carl Zeiss optics with an f/2.2 aperture should help the Lumia 800 stand out, especially in low-light situations. To make better use of that lens, the Lumia 800 has a physical shutter button -- another nice touch. High-end smartphones are supposed to be future-proof, but without a front-facing camera, the Lumia 800 isn't equipped for the Skype integration that Microsoft will inevitably build into Windows Phone 7. This is especially disappointing given that HTC and Samsung have included front-facing cameras in their own Windows Phone "Mango" handsets. Turn-by-turn directions are still a weak point for Windows phones. Although the built-in Maps app includes directions, it can't automatically track your location, warn you about upcoming turns or recalculate routes if you go the wrong way. Fortunately, Nokia has its own solution in Nokia Drive, which provides turn-by-turn voice navigation in 95 countries. It also supports map downloads, so you won't get lost in a dead zone. Although the MeeGo-based Nokia N9 included a choice of 16 GB or 64 GB of built-in storage, its Windows Phone counterpart, the Lumia 800, only comes with 16 GB. Although the Lumia 800 will include 25 GB of cloud storage through Microsoft's SkyDrive, an option for more offline storage would've been helpful for users who store lots of videos or music on their handsets. Follow Jared on Facebook, Twitter or Google+ for even more tech news and commentary.